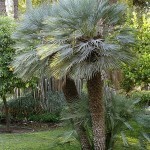 Distribution and habitat: Chamaerops humilis is the only palm species native to continental Europe. It is mainly found in south-western Europe – Malta, coastal Spain and Portugal, central and southern Italy, some parts of the southern Mediterranean coast of France – as well as northwest Africa (Morocco, Algeria, Tunisia). This palm has a stumpy, shrub like appearance, being usually found in extreme condition on sandy or rocky ground, appearing mainly on coastal fringe, on cliffs above the sea, on hillsides and in gorges, at altitudes normally below 1000m (3300 feet). 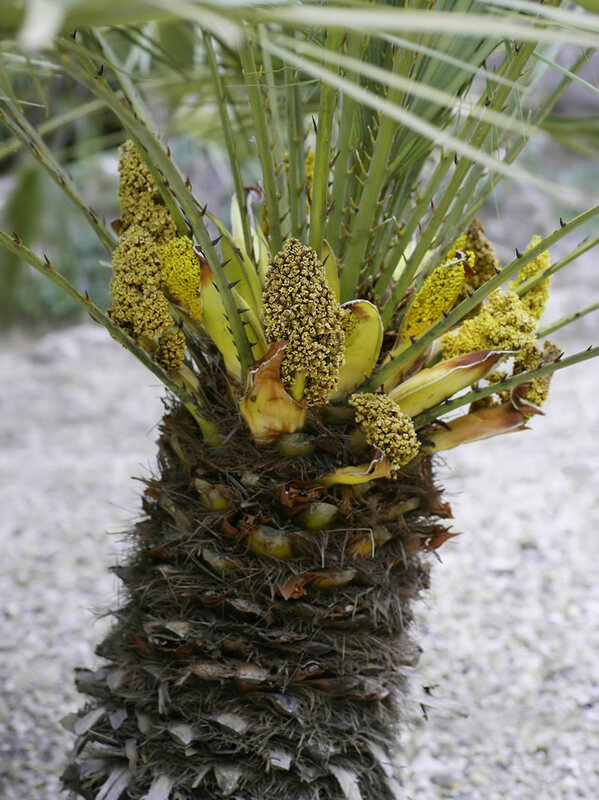 This dwarf palm tree can be considered one of the most representative of Mediterranean vegetation in the south-west of Europe. Sometimes they become great impenetrable palm colonies and others appear more scattered, in areas that are highly eroded and lacking in virtually any vegetation. Description: Chamaerops humilis is a bushy shrub with stems up to 1.5m (5 feet) high and carries fan-shaped fronds with stiff, 38cm (15 inch) long, strongly toothed stalks. Each frond is about 60cm (24 inch) across, dark grey-green and cut almost to the stalk into many rigid, sword-shaped segments, which are usually split at the ends. Young fronds are often covered with fine grey hair, but this falls off as the fronds opens. Flowers and fruits are never produced on plants grown indoors. 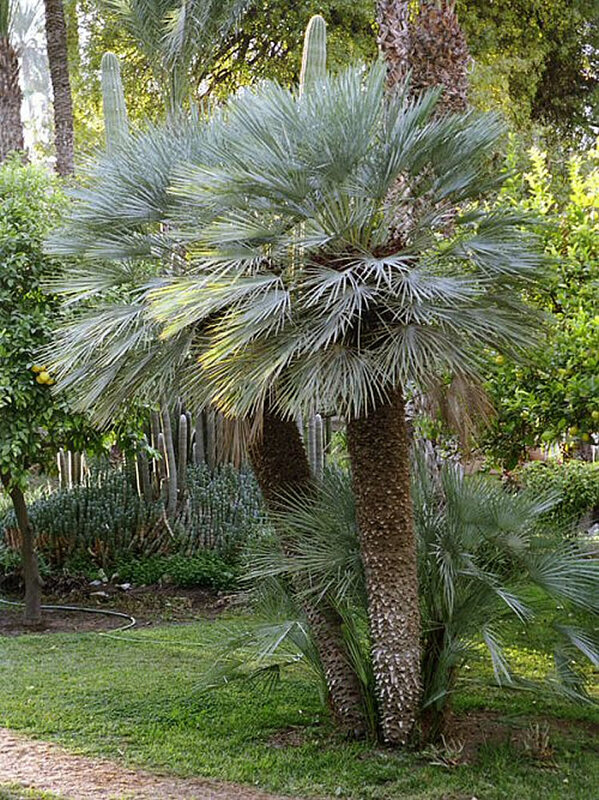 Planted directly in ground, Chamaerops humilis grows clustering to 3m (10 feet) tall, but sometimes solitary reaching 7m (22 feet) tall and about 30cm (12 inch) in diameter. The stems are covered with dead leaves and persistent fibers. As they mature they will develop multiple stems surrounding the main stem and have a tendency to form suckers all along the stems which will make them appear very shrubby and can lead to them becoming 4.5m (15 feet) wide. The inflorescence, which appears between the leaves, may be staminate, pistillate and occasionally hermaphroditic; all are about 15cm (6 inch) long, branched to two orders. Yellow male and female flowers are borne on different plants usually, although sometimes the flowers are bisexual. The spherical to oblong fruits, 1-1.5cm (0.3-0.5 inch) in diameter, may be yellow, orange or brown when ripe. These palms are known as a very variable species. Houseplant care: Chamaerops humilis is probably the best palm to grow in a container where it can survive drought, heat, wind, cold and long periods of neglect. These palms have petioles armed with upward-pointing spines along the margin; use extreme caution when handling them. Light: Give Chamaerops humilis palms three to four hours of direct sunlight every day. These palms will tolerate some shade, but their growth will be slower and the gaps between fronds will be greater if they receive too little light. However, they can acclimatise to an indoor environment in light that would prove insufficient for a great many plants. Temperature: Normal room temperatures are suitable for these palms. It is best if the temperature does not go below about 10°C (50°F). 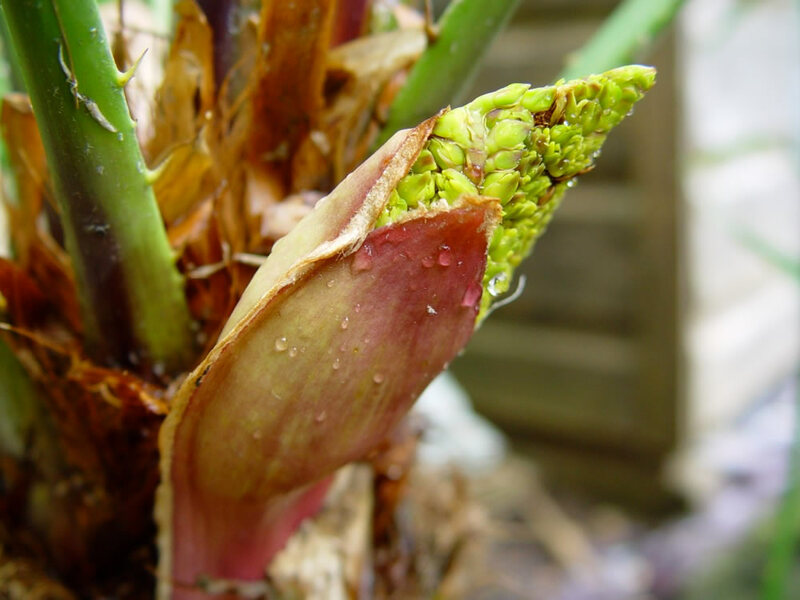 If possible, give plants a winter rest period at about 13-16°C (55-61°F). Watering: During the active growth period water plentifully as often as necessary to keep the potting mixture thoroughly moist, but never allow the pot to stand in water. 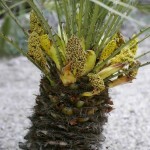 During the rest period, if any, water Chamaerops humilis sparingly, allowing the top two-thirds or so of the potting mixture to dry out between waterings. Feeding: Make a regular application of liquid fertiliser to actively growing Chamaerops humilis palms about every two weeks. Potting and repotting: Use a soil based potting mixture. Once every two years, in the spring, move Chamaerops humilis palms into containers one size larger, until the maximum convenient size – probably 20-30cm (8-12 inch) – has been reached. Thereafter, top-dress the plants with fresh potting mixture every spring. 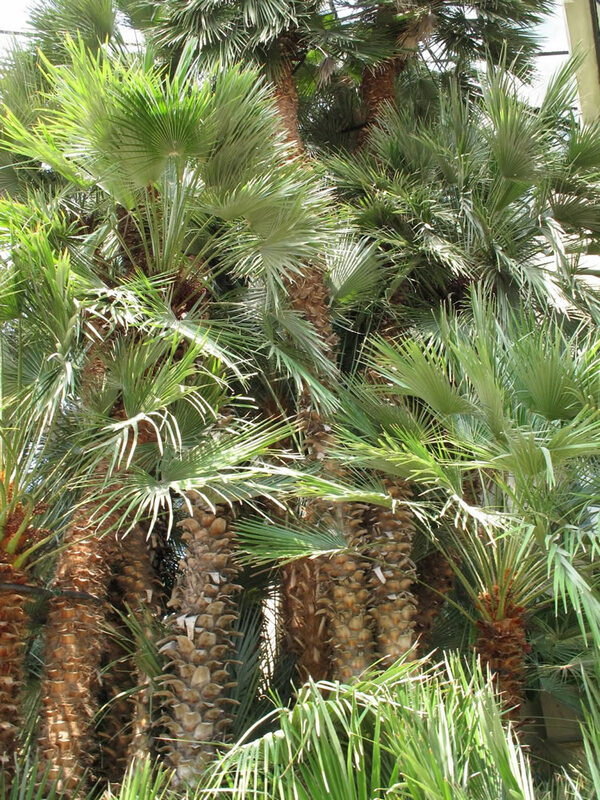 Garden Culture: Chamaerops humilis grows best in Mediterranean climates like Italy, southern California, Chile, Western Australia and Cape Town, South Africa. Cool winters with plenty of rain (or not) and hot, dry summers are the best home for this species. It does not acclimatise well in tropical regions, as it prefers temperate or warm climates, where it has proved very easy to cultivate. They can be planted year round and are easy to transplant as they have no need to form large root balls. Despite that their growth rate is slow, it is well worth the wait since even small plants will stand out nicely in almost any landscape. These palms will require a minimum of maintenance. Position: Chamaerops humilis prefers full sun in a well drained position, but seems to adapt well to shade and damp locations where the soil is not prone to water-logging. It grows well in semi-shade (light woodland) or no shade. Their growth will be very slow when they are planted in the shade. These palms are wind resistant once established as they, in their natural habitat, are growing usually in sunny positions that are exposed to winds. Also they are suitable for being planted near the sea and can perfectly withstand the salinity. Soil: Chamaerops humilis can be cultivated in all type of soils, from very poor or clay earth, to soil which is stony, sandy, rocky or very shallow. It prefers well-drained soil which is kept moist and rich – particularly, it grows well in lime. These palms do well in both alkaline and acidic soil. Irrigation: Chamaerops humilis prefers dry or moist soil. It will take severe drought, but is happiest with regular, if infrequent water. Fertilising: Its growth is slow or medium and its nutritional needs are low if it receives frequent watering in summer. 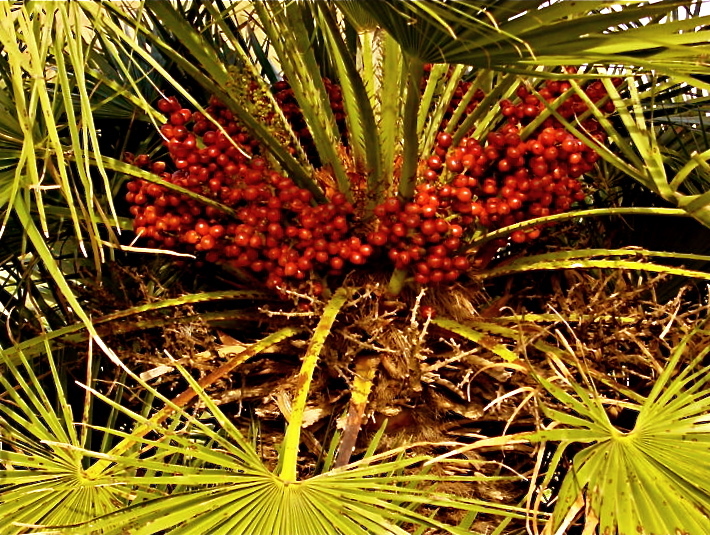 However, young Chamaerops humilis palms should be fertilized with a high phosphorus fertiliser to improve their growth. Mature palms should be fertilized every few years with a general purpose fertiliser. 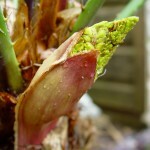 Propagation: Chamaerops humilis is possible to be propagated either seed or suckers. The fresh seed sown in early spring at a temperature of at least 18°C (64°F). The seeds will germinate in 2 to 3 months of warmth and humidity. Chamaerops humilis can be propagated from suckers (basal growth) whenever these appear. Take a sucker 20-25cm (8-10 inch) long with some roots already attached, plant it in 13cm (5 inch) pot of moistened soil-based potting mixture and keep it at normal room temperature in bright filtered light. Water only sparingly enough to make the potting mixture barely moist, until such time as new growth indicates development of active roots. Thereafter, treat the young plant as a mature Chamaerops humilis. 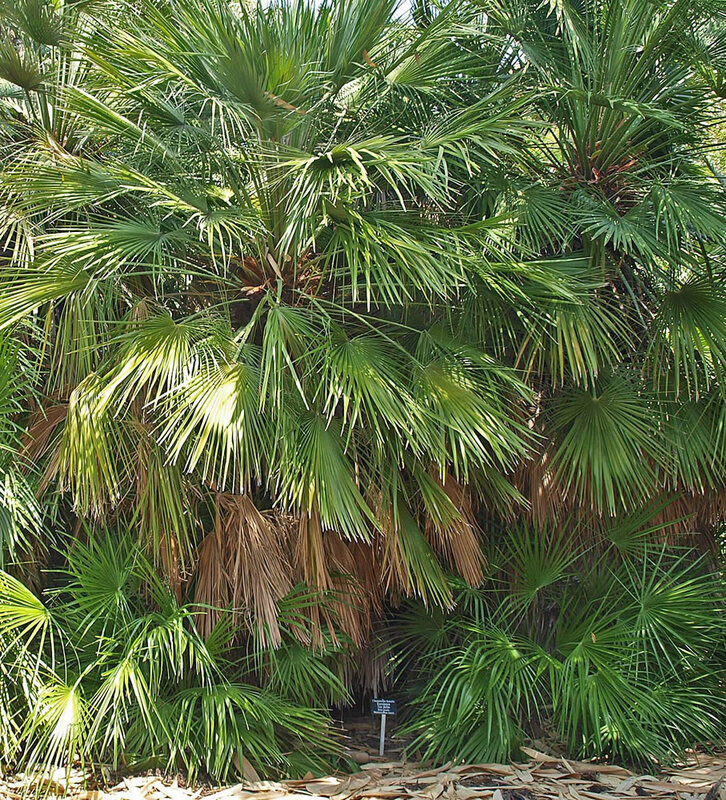 Problems: Chamaerops humilis is not effected by pests and there are no plant diseases that affect these palms. Chamaerops humilis var. arborescens differs from the type species in having only one stem up to 2m (6.6 feet) tall. 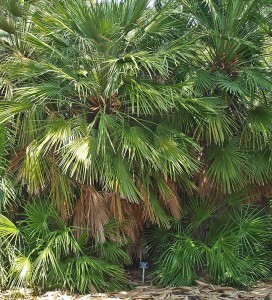 Chamaerops humilis var. 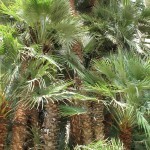 argentea (synonimous: Chamaerops humilis var. cerifera) has fronds that are silvery instread of grey-green. 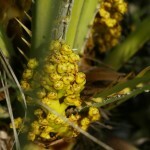 Chamaerops humilis may be confused with: Serenoa repens is also palmate with a spiny petiole, but the teeth are small and crowded along the margin. Acoelorrhaphe wrightii is similar, but the petiole spines are short and may be curved to point upward or downward. 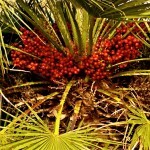 Uses: Chamaerops humilis is used in gardening and landscaping in many parts of the world. In temperate regions it is usually cultivated as a houseplant, though in sheltered areas it will survive short periods below freezing point. 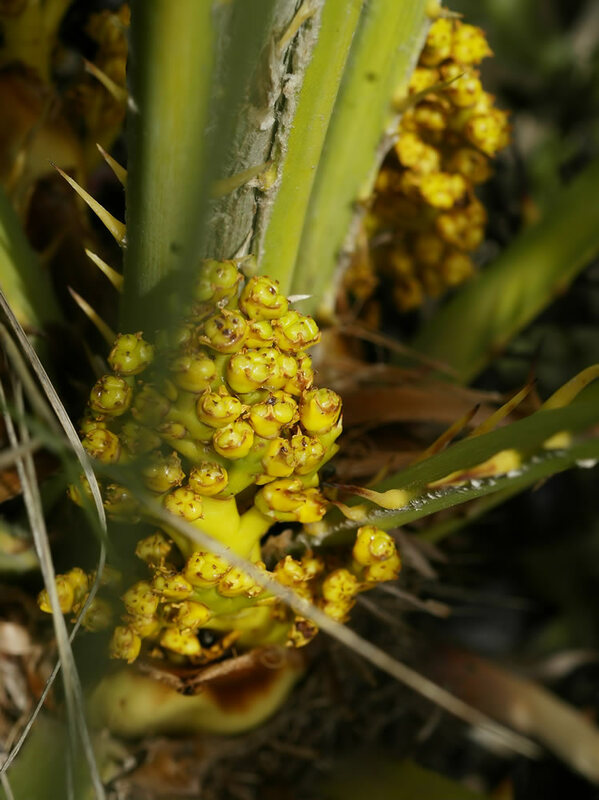 Since the leaf stalks are spiny, Chamaerops humilis may also be used as a barrier, planted 1 to 1.5m (3-5 feet) apart. It can also be planted in a mass on a large-scale landscape forming a fine-textured accent area. Thanks to its rusticity and ability to regenerate after exposure to fire, Chamaerops humilis is ecologically very valuable against soil erosion and desertification.